Stores aren’t like they used to be–what one sees is pretty much what they have in the entire building. When there is a “possible” winter storm here, it doesn’t take but half a day for the stores to be stripped down to almost nothing, and the first area to be cleaned out is potato chips! (My brother-in-law works for Frito-Lay so I get the detailed stories, quite sad actually). Research surprisingly shows that most cities contain only a three-day supply of food for the citizens; thus, government agencies are now encouraging a mere three-day emergency supply kept on hand should something bad happen! I remember reading all that (and more) and being quite disbelieving: “Just a minimum three days of total food in a home?” Three days. I had never really thought about how many people must not can or bake or cook. If they don’t have even three days worth of food in their home, they definitely don’t can! (It is too addicting!) Cooking, well, requires foodstuffs like flour and other items to “create.” Many are so used to the status quo and everything as is; it takes the government recommending it to get people even thinking about having more than a day’s food in the house?! Then, there were the pandemic scares where the government said we may be told to stay in our home for a month so all should have supplies for at least a month. When I went to purchase a house here in Colorado, the realtor would show me a tiny cupboard and say, “If you need more than that for a pantry, your family is eating too much.” Furthermore, when I’ve talked with neighbors and friends who eat out frequently and shop nearly daily, I can see where the problem lies. Empty pantries. Living out in the sticks during my childhood left me with some “self-reliant” ideas for the pantry that are now looked at as turning back to the past and lost skills–becoming like ” our grandmothers.” Hmmm. We were 21 miles from the closest town of 4,500 people, and it was in the northern half of Alberta, Canada, in the small town of Vermilion (three miles of gravel roads to even get to a paved road). We never knew when a blizzard would come up, and we’d be snowed in for a week or more. My mother set a wonderful example for me that I’ve never regretted. It was a way of life. 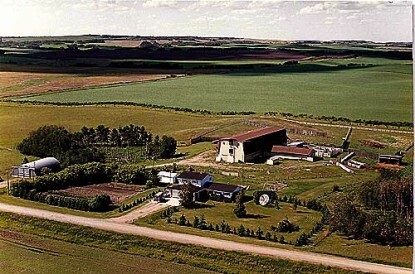 The farm in Canada where I grew up. When my husband and I lived in Cedar Park (suburb of Austin, TX), a pretty substantial hurricane hit the coast. The flooding was all to the south of the city, but it turned out that milk and eggs came up from the south on that major highway to supply everywhere north. The huge town with its many suburbs were pretty much eggless and milkless for nearly a week until the floodwaters receded and the highway was again passable. The news showed all these upset people worrying for their children and terribly upset by not getting these items. It was actually quite intense. My own pantry is based on the knowledge that I learned from my family background. When storms and trials come, I can be at ease knowing we are safe and have lots of various foods, much from canning and gardening. We seriously do our best to not depend on others for critical times, like food shortages. I do not want to run to the store each day to retrieve items–then I get lured in to possible impulse buys and waste precious time. I’m hoping this summer blesses my family with some great gardening so I can put up lots more food. I also plan on watching for great sales that come in the summer, such as peanut butter and tuna! I am grateful that I know how to cook and how to put food up. It is extremely rewarding to me to feel the peace of watching over the future. My summers truly help provide for the winters. I aim to do my best to take good care of my family, always having food on the table by keeping my pan full. Beans, Beans, A Magical Fruit! Good post. I was so grateful for my well-stocked pantry when my husband lost his job 6 months ago. It was a total shock, as we always considered his job very stable. I can feed my family, and only shop for a few fresh items and loss leaders to replace items I have used. Yet we eat very well. My adult children also often “shop” from my pantry. And what can be more satisfying than planting seeds or plants, picking the fruits and veggies, and canning them yourself, knowing exactly what is in each jar? And it all tastes so much better than storebought! It is totally a satisfying lifestyle, with many benefits. This is something I am in the process of creating. Thanks for an encouraging and helpful post. I really like the list on http://www.cphd.ucla.edu/pdfs/Pandemic%20Pantry.pdf – thanks for posting the links! Great post! I think there are quite a few of us on CITR that have realized this and are working our way towards it….. I grew up with cupboards full of stocked things, Mom canned, and Dad bartered skills for meat in the freezer. But I left home 22 years ago with a “plan”. HA! That plan didn’t involve me cooking or canning, I had corporate ladders to climb. I COULD cook, but that isn’t how I spent my day or evening, we did a lot of take out, something picked up on the way hom. Then the economy crashed 2 years ago — I’ve done a lot of realizing and switching around my values. I didn’t build my pantry 10 years ago with canning and storage in mind, but I used to shop every 6 months from Sam’s Club for supplies and bought milk, bread, and meat weekly. So it definitely can hold my year’s worth of canning and preserving! Mom was one to stock up on things. She canned, froze, and bought what we needed and the shelves in the pantry off the kitchen and in the back of the garage were always filled, not to mention the freezer. She bought meat in bulk and froze veggies and fruit. We always had dried milk on hand in case we ran out of milk. One thing she taught be to keep on hand in bulk was toilet paper. To this day, if a winter storm is forecast, I always check to see if we have milk, bread, and toilet paper. While my pantry is nowhere near as large and complete as Mom kept, I do stock up on canned goods, dried goods, and toilet paper. If an emergency happened, we’d survive for some time before we would need to restock. Dried milk, bulk flour, eggs from my dear hens, meat in the freezer, and veggies in the pantry would keep us going for a good while. I like the feel of having a stock of food on hand. You never know when a flood or other disaster may hit. I’m glad Mom taught me how to can, freeze, and store. I added dehydrating to my skills in later years. It’s a good feeling knowing you’re ready if something should happen. Great post and great comments – good reminders that weather disasters aren’t the only reason to be stocked up at home. Economic or health issues can quietly and quickly change our ability to purchase fresh food – what a terrible feeling to not be able to feed our selves and our family! 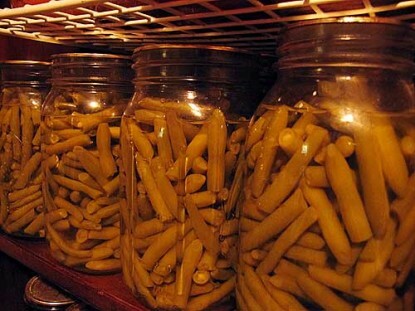 I look at my food storage as insurance – against many things. Knowing we can sustain ourselves (and well) in the face of hardship is a good thing! Moopsee, I was so glad that we had that mindset a couple of years ago when the ice storm hit here in Kentucky. We we’re so blessed to have a freezer full of food and a pantry well stocked with bought and canned goods. We also had water stored plus a back up to our well in case county water went out which it did! The government took 3 days to get a generator to the water plant plus those with electric water heaters had no hot water and many couldn’t boil the water for drinking when it came back on. Those with no heat were in shelters with their children trying to stay warm. When FEMA showed up they delivered food packages with peanut butter that contained salmonella!! My mom and I were cooking and taking food to the local shelter and offering neighbors showers at our houses. We have back up propane heat, a propane hot water heater and a large generator that runs 90% of our house including the freezers, fridge and the igniter on the propane cook stove. You learn many things that you hadn’t even thought of when you go through something like this and it adds to your preparedness for next time! Who would have thought 16 days without power? And some people were even longer! Be prepared! You will be so glad you did when you need it! Sorry to be so long-winded!! YEAH, fellow pantry lovers! I saw the blog on Aisle 1 a few days back and I had already submitted this. I think it is something wonderful to encourage others on. As to TP, yes, even I heard the stories of using the ol’ Sears Roebuck catalog in the outhouse or the wrappers that come around the mandarin oranges…. I feel very blessed that we’ve had enough to tuck some away for the “unknown!” I’m loving reading your posts! Great post! We need to be prepared! I buy the super sale items in bulk too. It sure saves us a lot! Under the bed is a great place to store things like toilet paper, too. We found ourselves in a similar situation last winter. It was not fun, but we didn’t have to worry about going hungry when the weather caused sequential power outages. Good reminders, all. Thanks, Moopsee! That was a great post Moopsee! What a great place to grow up, too! What’s up with the realtor? Odd thing to say, no? Great post! Moopsee! We were very short on money last winter, but I have always stalked up on things like dried milk, flour, sugar, lots of dried beans, rice, all of these things got us through the winter. Now I am stalking up again, and learning how to pressure can, I love all of the wonderful recipes and ideas on this site, thank you so much for sharing. I think the realtor knew how totally insufficient the pantries were and, desperate to make that sale, tried to turn the blame to your family “overeating”. Ridiculous! I do the same thing We too live in the country and sometimes can be snowed in for several days We have wood stove so we can have heat in case the electricy goes outs and I have candles and kersone lamp as well. Great post. Isn’t it wonderful knowing that you have what you need, when you need it? Weather diasters are something to always be on the look-out for but many have experienced severe cut-backs with the economy and job layoffs. If you suddenly have health issues, a well stocked pantry gives you peace of mind. Even if you just had a bad day or got home late from work, like tonight, a well stocked pantry can be a real lifesaver. My Aisle 1 is reassurance that I’m prepared for most things. I’m sure you feel the same. Wonderful points through out the article. Our electric often goes out for short periods in the winter. However one year it was off for 10 days, last year we were blocked in by downed power lines and fallen trees for a week (including Christmas Day) and three years ago the transformer next to the house caught on fire on Christmas Day. Having a pantry and wood stove etc has saved us from a lot of misery (we stayed in a shelter once years ago, ugh) All of the suggestions you all made are practical and sensible and thanks for the websites. There is one thing I would like to add be sure you have enough animal food, it is best to have at least a couple of weeks ahead for them too even if you only have a cat but if you have lots of animals as some of us do it is essential. That is really wonderful information for everyone no matter where they live. We live in North Western Oregon. Two years ago we got snowed in and had to help people get up the hill. It is also necessary to have tractor fuel or truck fuel if you have a place to store it. WE have two 4×4 tractors and my husband pulled some people out and opened the road so we could all get in and out after a week or so. He thinks I put too much away until the winter comes and like this year I am cooking for a Holly Farmer so she don’t have to because her whole crew is up to their ears in holly and greens, shipping and long hours. If you would like to see some beautiful works of art go to www. 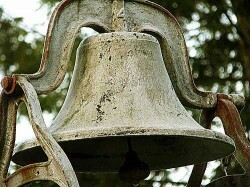 Oregon Holly.com. I have 3 full freezers, one of beef, one for port and the other is for fruit and vegies. I keep an inventory of evey one on one of my refrigerators. I also have shelves full of canning. We have our own cows so I don’t need for anything here and have come to the rescue of people in the past. We also have pigs, chickens and beef cattle. We live 5 miles out of town and there are still lots of people who think they can just jump in the car and go to the store. We have lots of animals also and just stocked up on grain and have an extra 800 bales of hay for the winter. Awesome article! Thank you. I know people don’t have a three month supply let alone a 3 day supply. My goal is to have enough in my storage for 5 years. Hoarding. NO, I have 8 kids! Who knows how many more The Lord will bless us with. Then I also have tons of their friends that stay over. Trust me, a five year supply will only hold teen boys for maybe 3 days to 3 weeks!! Fantastic! I wish more people would have more than a 1-3 day supply. More like a 3-12 month supply. Of course with my large family, I never know if my supply will be enough with all the teens that are here, both my kids and their friends. Oh, I have just loved the feedback from so many of you. This is a wonderful thing!! With city living, the things that I wish I could have are on the backburner. However, I have been studying different cultural recipes to gain insight on new ways to use beans etc. Learning to do better with curries, chiles, and on and on the list goes. Now lentils easily fit in as a larger quantity item that is easier to cook. I try to never take for granted all that I am blessed with. And yes, we have 5 kids that can really eat — especially if the “like” it. 🙂 I hope you all hit up the Christmas/fall sales. Keep up the protection of your families! This is just incredible to see so many use common sense to provide for their family, animals, and even neighbors!! !